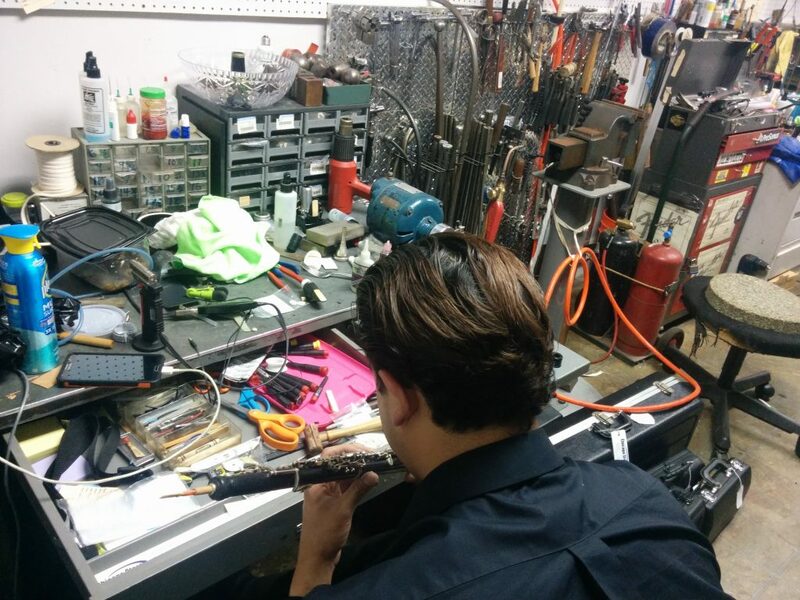 Chicago Store maintains an on-site full-service repair department specializing in brass, woodwind and string instruments. Repairs are serviced through either of our two convenient locations: 45 S. 6th Avenue, or 5646 E Speedway Blvd. Mike Vaughan, luthier and manager of our department, is a wealth of knowledge and leads a team of specialists with combined experience of over 75 years. Our team of professionals can handle just about any type of repair. From simple string changes to complete overhauls, we have the experience and technical ability to provide quality service at affordable prices. Mike is our repair shop manager and head technician. He started with us 1979, and is a Fender-certificated technician, experienced with fretted instruments, band and orchestra, percussion, and tube amps. Mike has played with many bands in the past and currently plays lead guitar and sings with the Henry Limon group. 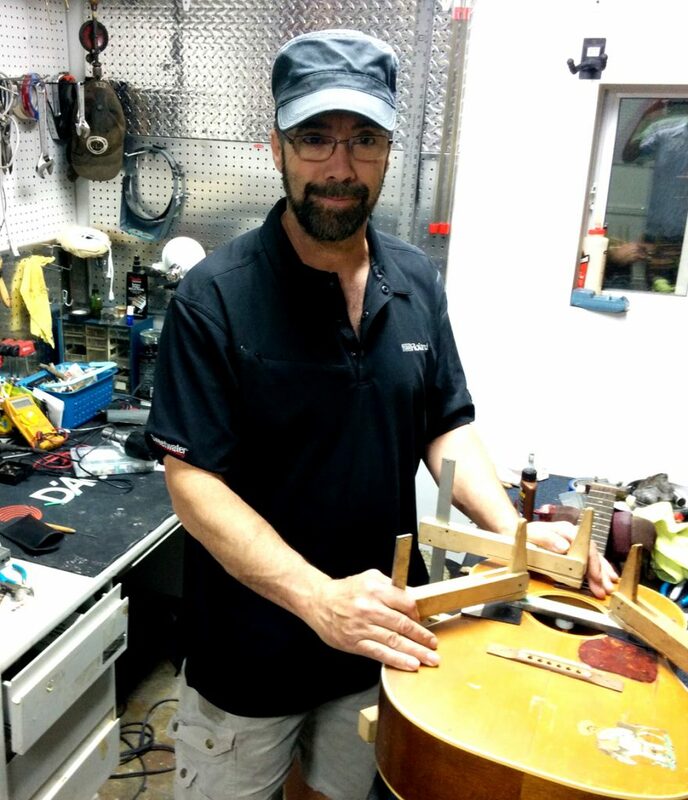 Mike has repaired instruments for the New Christy Minstrels, Michael Schenker (Scorpions), and George Lynch, as well as local musicians such as Howe Gelb, George Landa, and Tom Walbank. He sold Johnny Cash six Martin guitars during his last visit in 1985! Mike delivered and tuned Ray Charles’s Rhodes piano that we rented every year when he came to town. We can’t count the number of times folks have complimented the quality and value of Mike’s repairs. 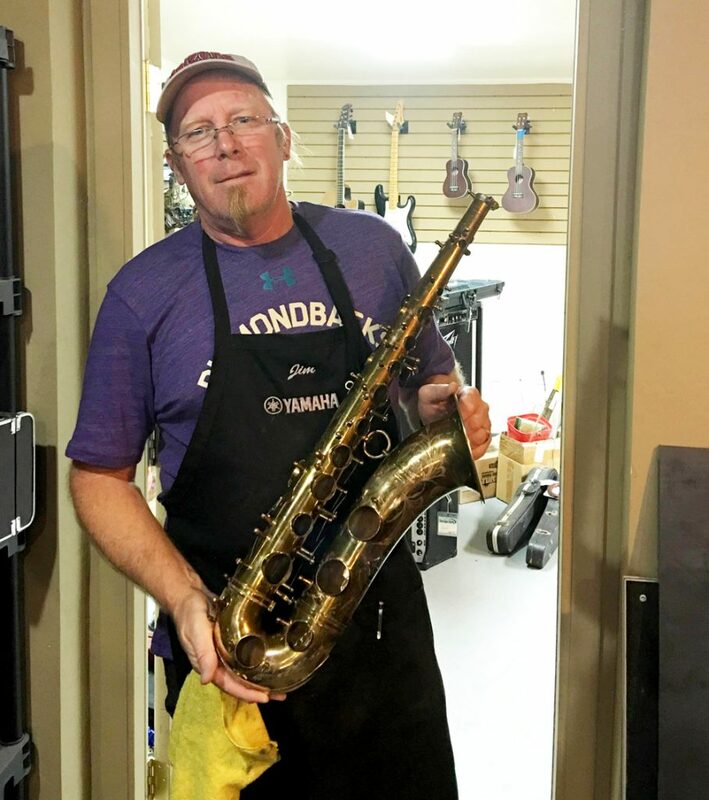 Jim comes from the Pacific Northwest and has over 20 years of progressive experience in servicing, repairing and customizing all woodwind and brasswind instruments. He specializes in Saxophone repairs and professional set ups. Jim currently services saxophones for the University of Arizona Saxophone studio! He has worked on horns for Tower of Power and other top LA and New York musicians! 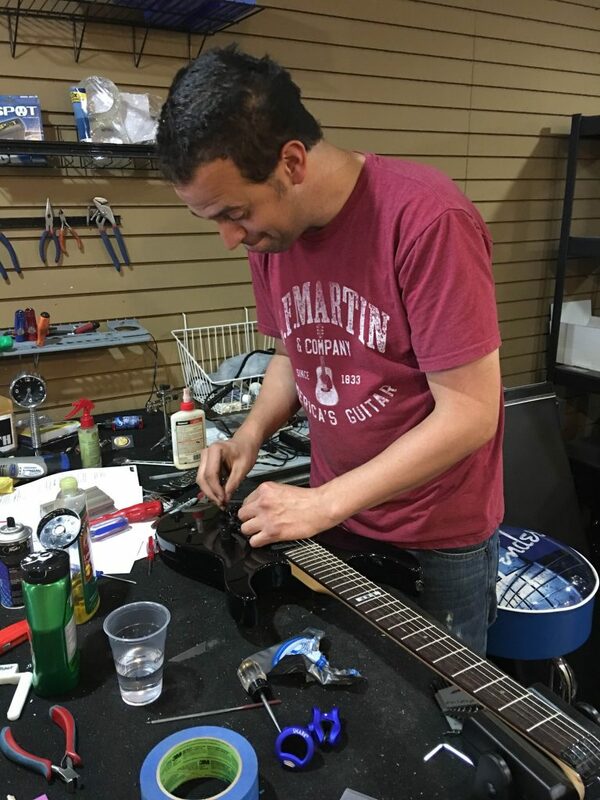 Ryan has been repairing and modifying string instruments since 1997 and spent a number of years working in Washington States thriving custom guitar manufacturing industry. A bassist by trade, Ryan has vast experience working on guitars, basses, banjos, mandolins, violins, violas, cellos, and other stringed instruments from around the world. I have been doing business with The Chicago Music Store as an educator and musician for many years. This is a new and improved place to do business! The recent award winning renovation is beautiful and their customer service is better than ever. Their technicians are fast, friendly and very knowledgeable…… If you prefer one-stop shopping, this is the place! I have been a Chicago Store customer for many years. The people at Chicago Store are friendly, knowledgeable and professional. As a band director I’m always dealing with a large number of student instruments. Dan in the repair shop has made my job so much easier by ensuring our instruments are always in good working condition. I especially appreciate the sense of family among the employees in the store and always feel at home when I’m there. 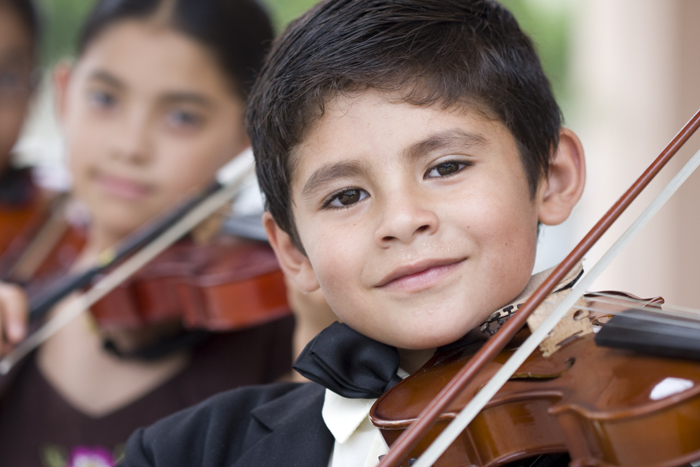 Chicago store has everything a music teacher needs and then some, all in one location! Chicago Store has been a part of my life since 1972. I purchased my first amp from the owner Joe Levkowitz and throughout the years Mark Levkowitz and his crew have always had the time and quality instruments for my band. Mike Vaughan in the repair shop is an excellent Luthier , I trust him will all my guitars and actually had him build two custom guitars for me. Whenever my band Los Nawdy Dawgs has to open for a national act, we take all our guitars to Mike to make certain they are ready for the shows. I highly recommend Mike and his staff to anyone looking for quality service. I brought two old broken violins and a couple of wooden flutes found in a storage box belonging to a family member into the Chicago Store. Mike and his staff researched the instruments and identified the flutes (one was actually an early clarinet) as being pre1900 collectable pieces. If not for their honest and knowledgeable evaluation of my instruments I would have never discovered I was in possession of rare and collectible instruments. In addition, Mike did a wonderful job of restoring one of the violins to playing condition. I could not be more pleased with the attention and service I received. As band director at Buena HS I have taken my band’s instruments for repair to The Chicago Music Store for over 20years. I’ve found they stand by their repair work, are not overpriced, and ready to help in an emergency. There have been many times I’ve called for either myself or a student needing that last minute “something” fixed and they’ve made the time and effort to save the day. As Band Director for the Fort Huachuca Accommodation Schools, I used The Chicago Store almost exclusively for all my musical needs. This included not only their easy on the pocket instrument rental program, but also sheet music and other instrumental and choral accessories. The Chicago Store staff was always professional and accommodating to my needs and requirements. The quality of the instruments as well as their extras made it easier for me to run a successful music program for 30 years. I’ve so enjoyed my affiliation with The Chicago Store that following my retirement as band director I joined their staff. Come see me in the Repair Department sometime soon!